Dacia has renewed the Duster SUV with new styling that the company says improves quality and brings new equipment to the model. With more than two million Dusters have been sold since launch, becoming one of Groupe Renault’s top selling models, thanks to the vehicles’ price, off-road ability, robustness and design, the company said. 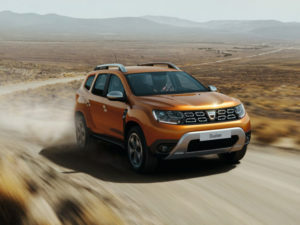 The all-new Duster builds on the previous vehicles abilities, keeping the car’s weight low (1,160 kg for the 4×2, 1,250 kg for the 4×4 for the original Duster), with a tall ride height that helps it navigate difficult terrain, thanks to the subframe being adapted to all-road and all-terrain use with a raised ground clearance of 210 mm, short overhang (822 mm at the front, 820 mm at the rear) and reduced crossing angles (30° angle of attack, 23° ramp angle, and 36° angle of departure for the original Duster). The new Duster adds a new colour option, called Atacama Orange and sports new LED daytime running lights on its refreshed front end. At the rear end, Dacia’s four red stacked squares lighting signature has been adopted. Further details of the new Duster will be revealed upon its launch at the 2017 IAA in Frankfurt.